Even though Facebook is pushing for boosted posts and not always showing your latest and greatest to your audience, there are still important things you can do to make your page its very best. Try not to use your logo for this. People do business with people, and there are plenty of opportunities to use your logo everywhere else. Have a professional headshot done, or get a friend to take a photo of you when you’re dressed up for a fancy event – the more professional, the better. Use the photo description area to tell a little about yourself and welcome your visitors to your page. You may use your logo here, or you may choose to showcase your products and/or services. 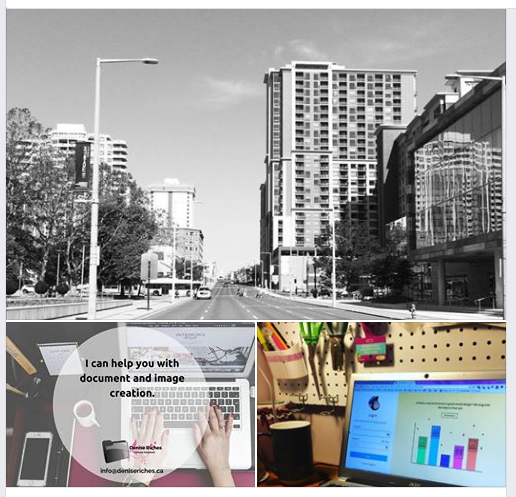 You can even create a series of images (in Canva or another online photo-editing app) showcasing several products or services. Just make sure to add a description to this area. Explain what you do, why you do it, and for whom. Also, add the best way to contact you. Whether it’s to send you a private message, book an appointment or call your office, make use of this important feature. Page visitors will look for this. This feature has only recently sparked interest, but it’s prime real estate for page visitors to quickly and easily learn more about your business. This is where to tell your visitors how you began your business, and how you can help them. Add a pretty photo or logo and as always, make sure contact details are included in the text. Even if they are from friends or past clients, the more you have, the better. And don’t feel bad about asking for them, either. If people believe in your product or service, they will welcome (if not jump at) the chance to give positive reviews. 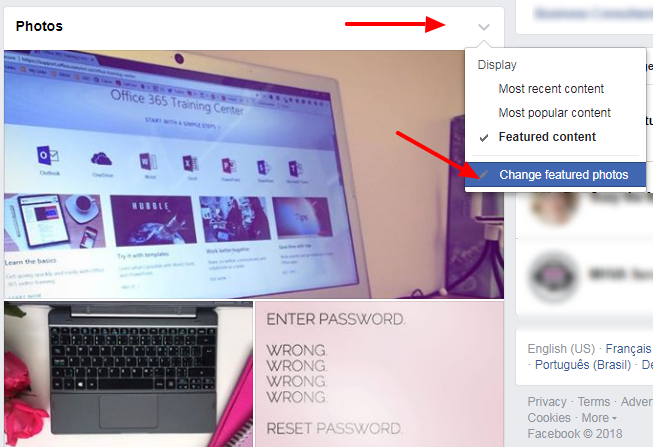 This feature is for anything that you want your visitors to notice first. If you’re having a contest or giveaway, pin them to the top so people won’t miss out (especially if your page is busy because pinning it keeps it at the top). That column along the left-hand side isn’t just a decoration! This opens up your other social media channels, within your page, and page visitors can see what you’ve been up to elsewhere. Definitely, connect if you haven’t already. Use as much detail as you possibly can. Your page visitors shouldn’t have to go searching anywhere else online for information about your business and what you do (even if some of it seems repetitive!). Give as much information as possible. Not sure about including your address? Use a spouse’s or trusted friend’s work address. Also be sure to add your business hours. Find the Photos section on your main page (not the left-hand column), click the down arrow and select Change Featured Photos. Facebook takes random photos from your Facebook page and puts them here until you manually change them. You can select up to 5 (but the page itself will only show the first three unless a visitor clicks on “Featured Photos” to see the rest), and you can choose from any of the albums. The photos might not show after you change them in this window. Don’t panic! They will show up on your page after you close this window. It’s just another fabulous Facebook glitch. Have Videos? Share those too! If you have video files for your business, showcase them as well by uploading them to your page’s video section. Make sure to fill out as much information about each one as you can. A well-described video adds interest and entices your visitor to check it out. If you’d like to download this information, head over to my Resources page. If you simply don’t have enough time to put these into action, I can do it for you. Email me at info@deniseriches.ca. Let’s talk!